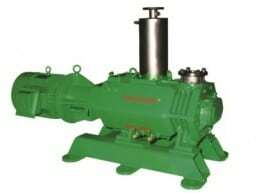 SVC Dry Screw Vacuum Pumps for Chemical Process applications. An efficient, cost effective, low maintenance, solution for aggressive applications, compliant with restrictive International environmental regulations. Standalone performance from 110 to 2,700 m3/hr with vacuum levels to 0.05 mbar absolute.